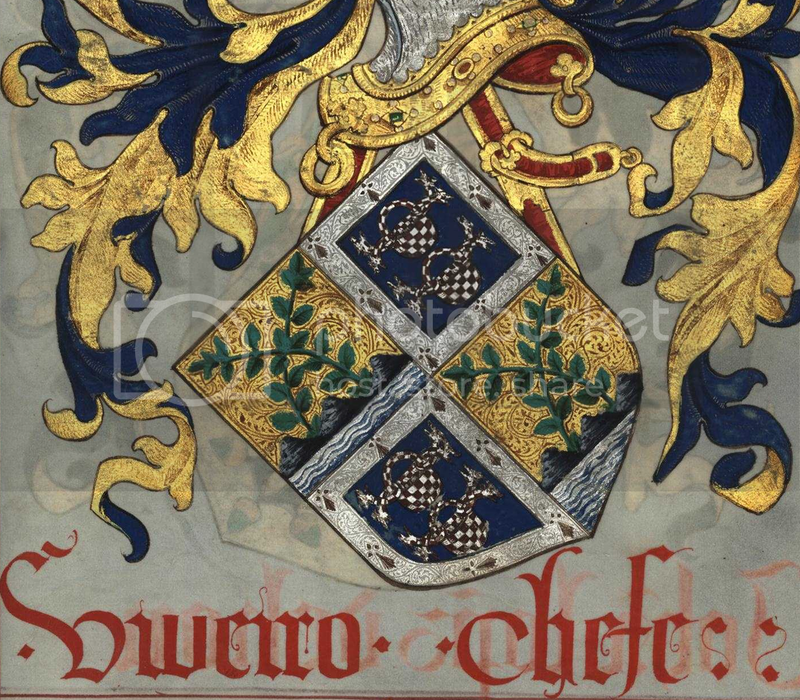 Manuel I - Joint arms of Manuel I of Portugal and his queen-consort Maria of Aragon. I have already made a similar arms which has less castles than the source image so whichever you choose, 8 is more than enough since I believe the castle is just an artistic expression by the author. 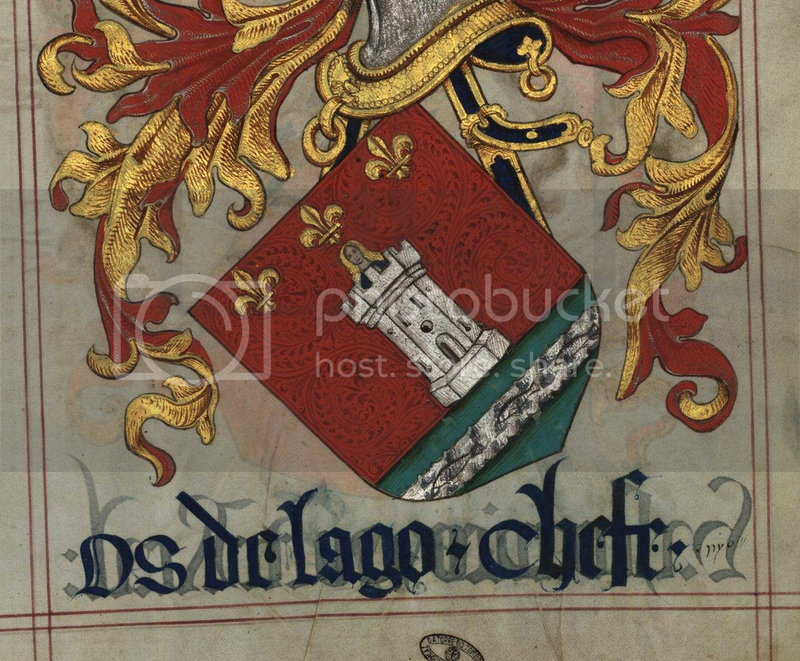 The arms in question is a cross between Portugal and arms of Maria of Aragon. The half shield of Portugal is from Saxe-Coburg-Gotha arms. Pachecho Livro - source image. 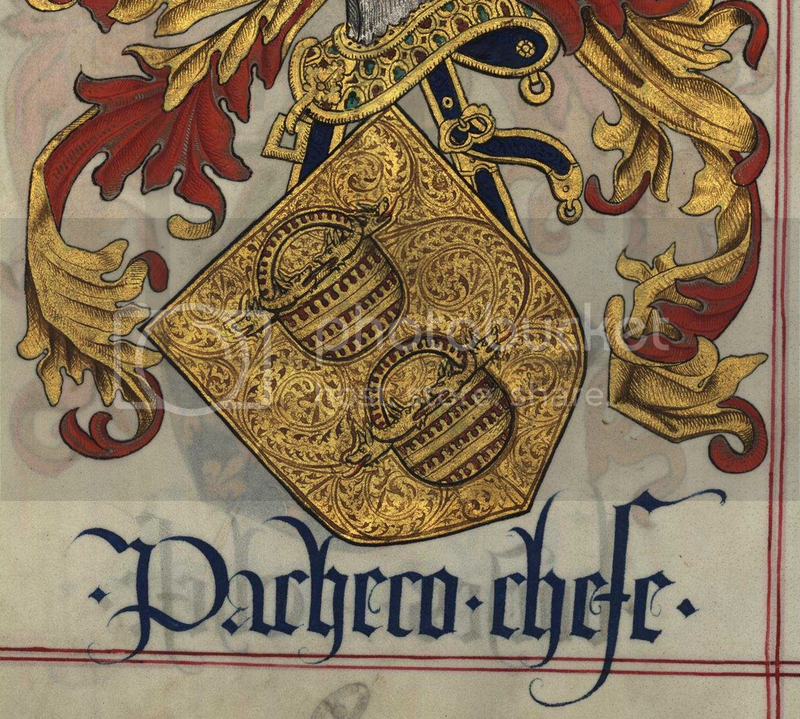 The arms of Pachecho in Livro seems like a hybrid of several cauldron variants we have: Pachecho, Manrique de Lara, Lara Ancient. The elements on the cauldron seem to be vaire nebuly similar to Vasconcelos f.e. Afonso Garces - Again the source image is pretty straightforward, complicated but clear. Gabriel Goncalves - source image. 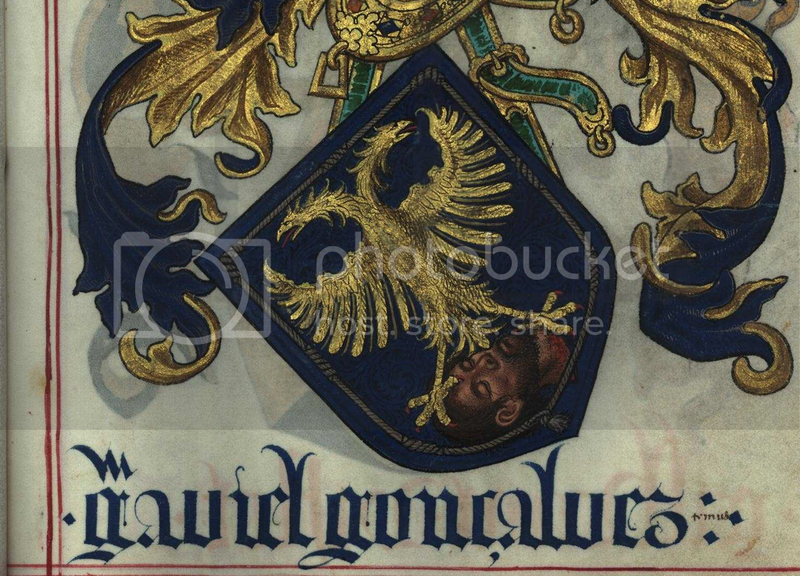 Arms is double-headed eagle holding a moor's head, all withing a "rope bordure" similar to Eca i.e. Eça arms. Abul - source image - shield split in two. 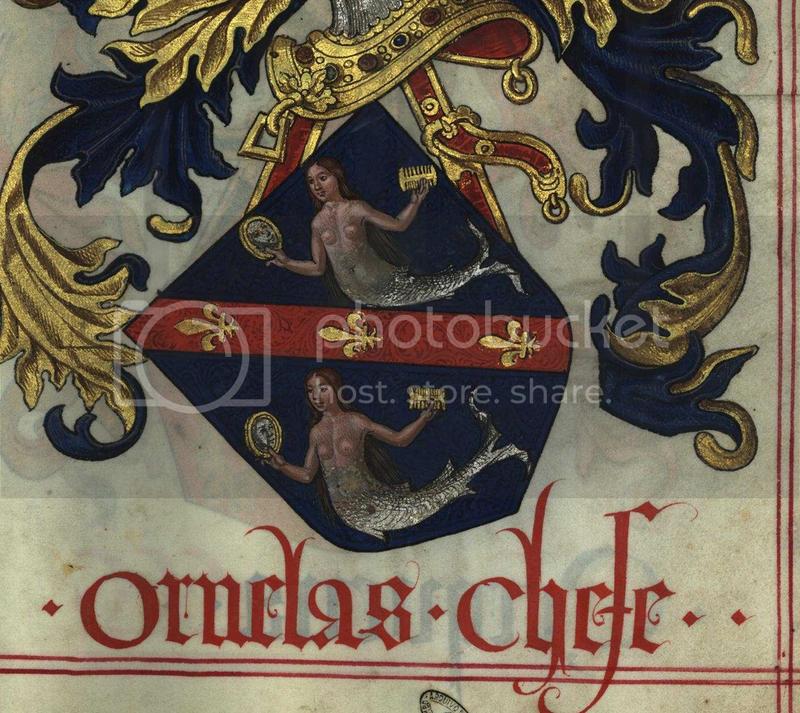 First half shows an imperial eagle like in the arms of Charlemagne, the other half is azure with a fess gules, fess gules charged with crescent argent, below fess two crescents gules. Viveiro - source image shows a shield quartered. 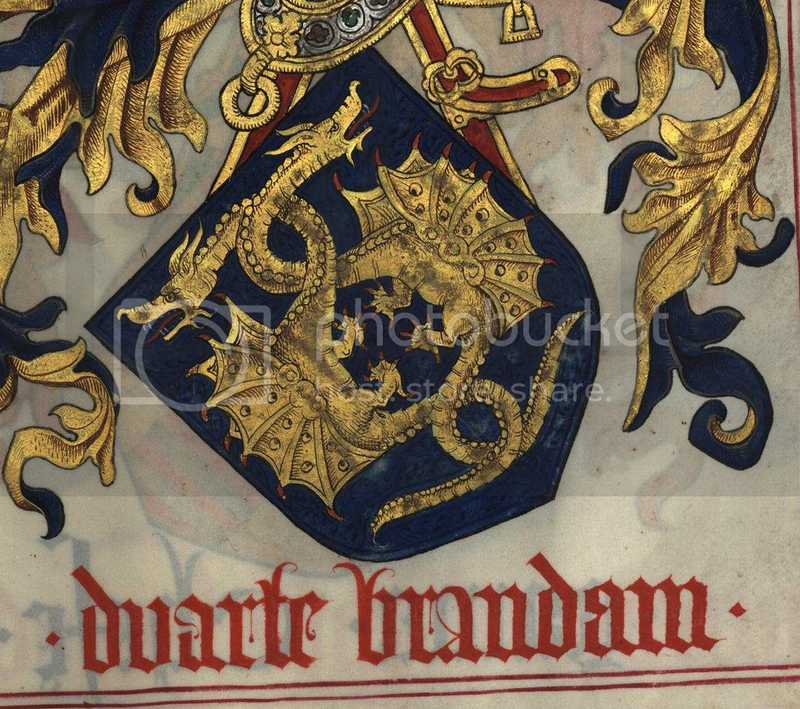 1st and 4th quarter are similar to Guzman or Manrique de Lara cauldorns (not so many serpent heads), cauldrons are completely chequy argent and gules on a azure field, bordure ermine. 1st and 3rd quarter are a variant of Fajardo quarters, water part seems smaller on this variant than on the example linked, while the branches are intertwined in a saltire. 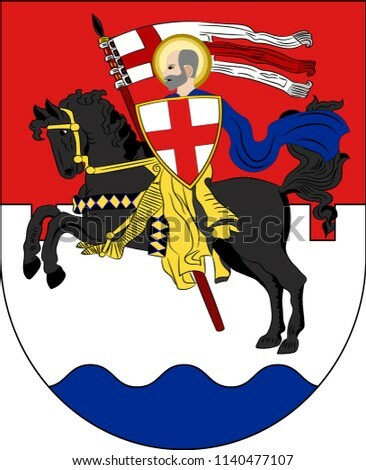 Duchy of Zara - Duchy of Zara located at city of Zara or Zadar. The only coat of arms missing to complete the Austrian Empire page. The arms show Saint Chrysogonus on a horse. 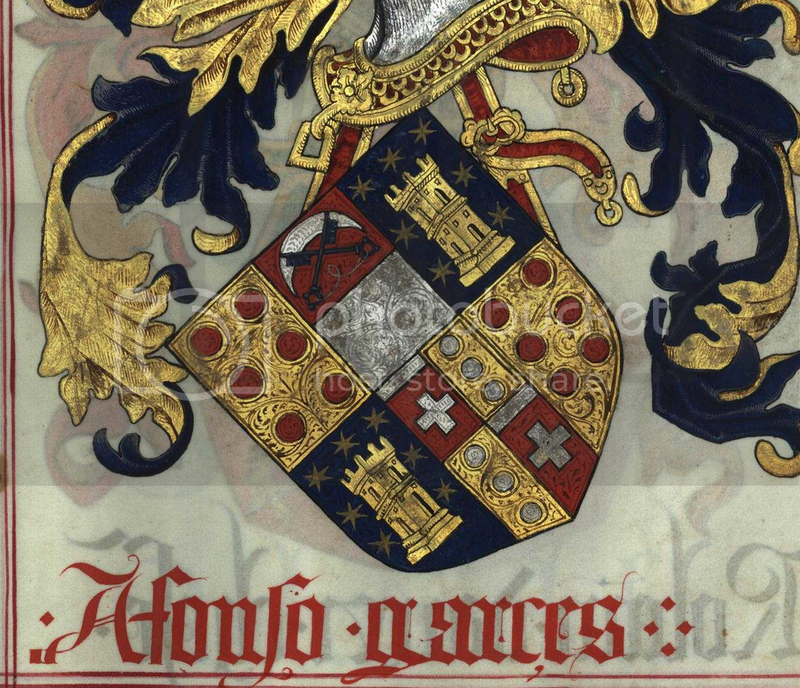 This arms has been also described in Arthur Charles Fox-Davies' book of public arms where he describes it as "argent, a mounted knight in full armor, his lance in pale, all proper" and shows an illustration. 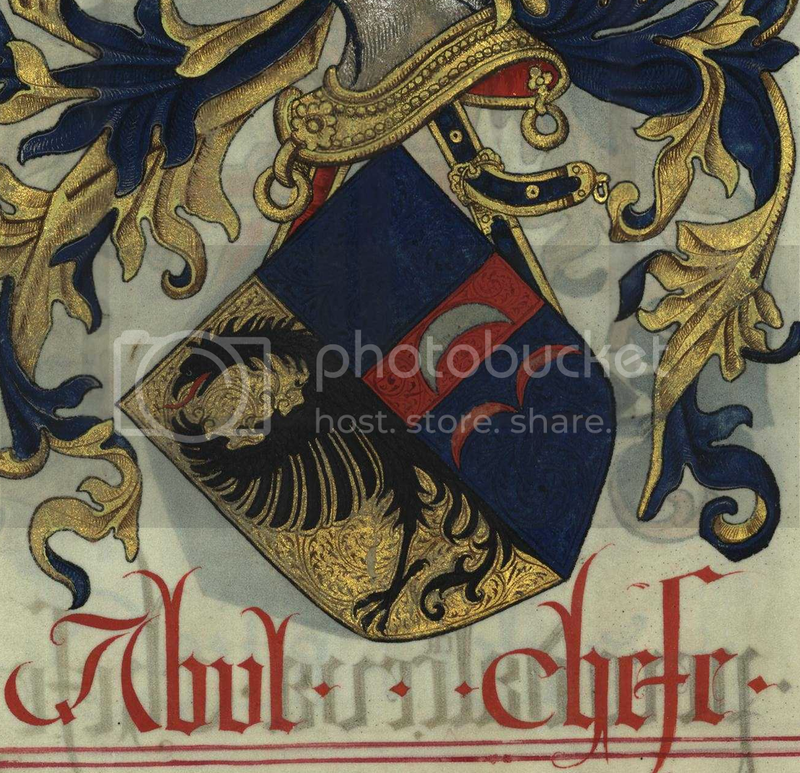 Current civic arms and dating back to early 20th century also draw directly from the historical arms that was eventually now modern arms of the city and also of the duchy in Austrian Empire. The best way to describe how I feel the shield should look is that it should be f.e. 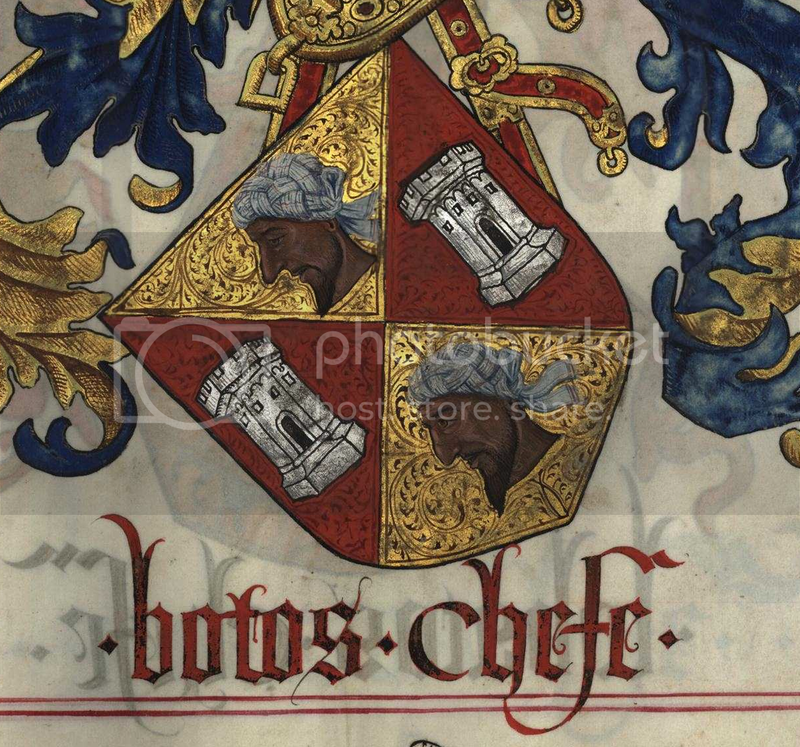 same as Vilnius but the position of the arms and lance correct, and also the rider would not have a helmet but a halo...also would carry a shield in the same manner which would be "argent, cross gules" i.e. as Genoa arms f.e. Colors of the shield in general would be argent, horde sable...adorned gold and red, rider's armor full gold. An example of the rider. I'll probably make an example just show what I mean. Sorry for the late reply, I have family at home so I can't do much this week. I made those changes to the page because it didnt look right to me. 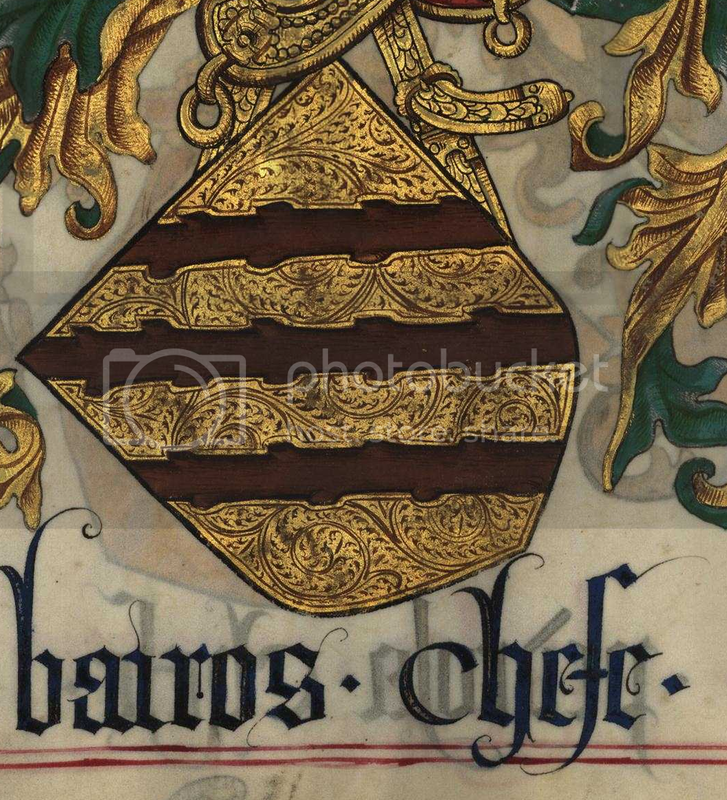 - Or/Sable are the arms of the french family (de la Heuze). They are from a "lieu-dit" in Quevilly near Rouen and descended from Jean de la Heuse living around 1000. His son, Pierre accompagnied duke Guillaume in England but came back (obviously). Those two individuals have no recorded links with Hugues and Guillaume of Tadwick, ancestors of the english family. Hugues and Jean may very well have been brothers or cousins but no author make such claim (afaik, I won't pretend to know that english family very well). - The Hussey of Harting, desc from that Guillaume/William, have different arms, obviously derived from the Taisson (fitz Erneis) familly. The branch in Charlcombe used those arms or at least a variant as shown on a 1267 seal (John H. of Charlcombe). - Nicholas de la Heuse is from a third dynastic group. The same as the later lords of Finchampstead. Those Hese/Hoese/Huese of Padworth, Finchampstead, Roudon and Chippenham have different arms in the various rolls. Nicholas in Herald's roll is the son of another Nicholas from lincolnshire who appears to have married a daughter of the Husseys of Charlcombe. His son Peter +1307 married the daughter of William Banastre of Finchampstead. The other daughter married Peter's cousin John said to be desc. from a brother of Nicholas Sr. 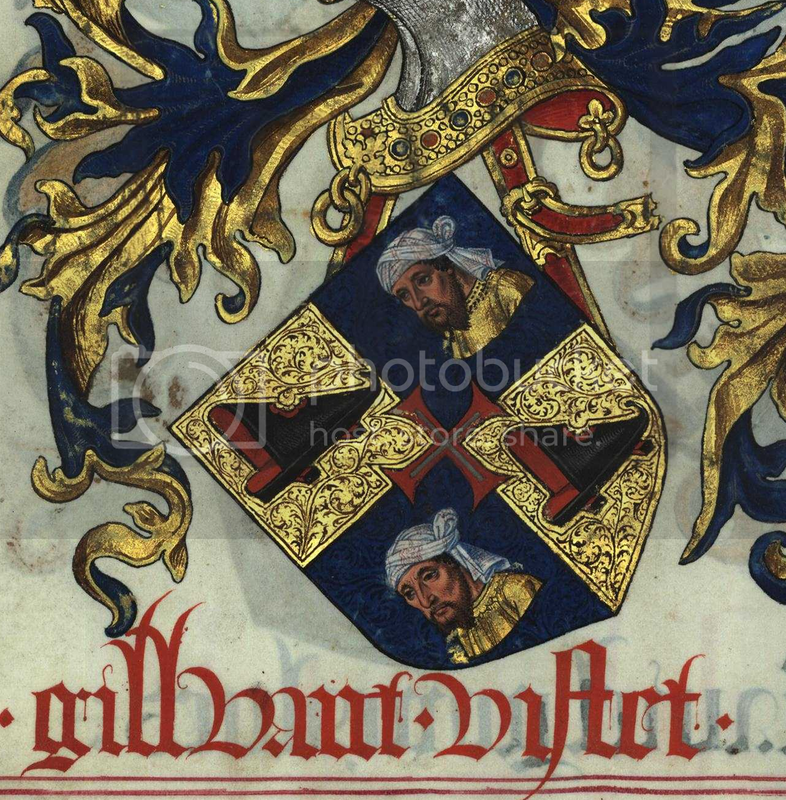 The arms of that John are figured in many later rolls and are different (fess betw 3 lions) from Nicholas' arms. - It's entirely possible (even very likely I would say) that the three dynastic groups stem from the same root but it's still conjecture unless there's a record of some sort (or at least a strong hint) or any kind of historical account. It is worth noting that place names like Heuzé/Heuse/Heussé/Houssaye/Houssel and other variants are rather common in Normandy so it's not definite proof. The various accounts on the Hussey family history point to a different origin (from the office of Butler, from La Houssaye or from Heussé in Avranchin which is closer to the Taisson), not that I trust those much.